With a distinguished appearance thanks to a tufted backrest, this shelter sofa is both elegant and commanding. 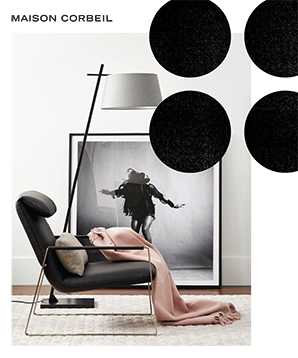 Sitting on massive black wooden legs, it is softened by its bolsters and elegant details. Commanding, the Oscar sofa sits atop sturdy wooden black legs. Its imposing presence is softened by the elegant detailing of its tufted backrest and decorative bolsters. This shelter sofa can comfortably welcome up to three people. Made in Canada, it is available in a choice of fabric upholstery. Its refined aesthetic is completed with the addition of four accent cushions, including two bolsters. This sofa is part of the Oscar collection, a Maison Corbeil exclusive. - 4 accent cushions including 2 bolsters. - Choice of fabric upholstery.